December 15 for Fall. September 1 for Spring. The Center for Biological Chemistry (CBC) offers a graduate program which is interdisciplinary. Research opportunities exist in a variety of areas, including plant biochemistry, photosynthesis research, plant and animal metabolism, metallobiochemistry, enzyme mechanisms, cancer biology, redox biology, and molecular biology. Biochemistry faculty and participating faculty in animal science, agronomy, chemistry, and biological sciences contribute to the program. 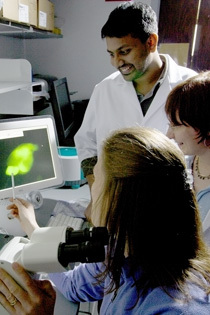 Instructional programs are focused in laboratories and classrooms within the George W. Beadle Center for Genetics and Biomaterials Research. The Beadle Center houses most of the department-affiliated faculty members in state-of-the-art research laboratories and many of the Center for Biotechnology and Redox Biology Center core facilities. These facilities include mass spectrometry, spectroscopy, X-ray crystallography, plant transformation, and microscopy facilities. Also available are an outstanding full-service plant growth and greenhouse complex, and equipment for fluorescence-activated cell analysis, surface plasmon resonance, analytical ultracentrifugation and next-generation high-throughput DNA sequencing. My long-term research goal is to improve the resistance of crops to abiotic stresses, in particular to low water availability and chilling temperatures. For additional details check out the dept./program website: Biochemistry.